Here’s how the New Yorker describes her latest project: “In a brilliant collision of cultures, the powerful blues and soul singer Martha Redbone has recorded an album called The Garden of Love: Songs of William Blake, produced by John McEuen of the Nitty Gritty Dirt Band. 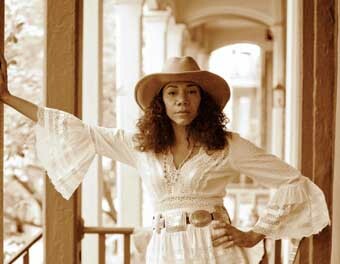 In it, the mystical, humanistic words of the 18th-century English poet are fused with the melodies, drones, and rhythms of the Appalachian string-band music that Redbone absorbed as a child from her grandparents, in Black Mountain, Kentucky.” If you haven’t heard of Martha before, she’s a stunningly soulful singer of Choctaw, Cherokee, and African American descent, steeped in the traditions of Harlan Country, Kentucky and Clinch Mountain, Virginia, who has followed her musical muse to Brooklyn, London, and Nashville, and composed her own musical settings for the poetry of the preeminent writer of the Romantic Age. The project really is a brilliant collision of cultures. Her music “chronicles the crossroads of the American experience,” says National Public Radio. Her voice holds “both the taut determination of mountain music and the bite of American Indian singing,” says the New York Times. Martha’s band features her longtime collaborator and husband, Aaron Whitby, on keys and melodica, Alan Burroughs on guitar and vocals, Teddy Kumpel on guitar, banjo, loops, and vocals, and George Rush on upright bass and vocals. Tonight’s show promises a one-of-a-kind experience, melding Native American, African American, Appalachian, and English folk music traditions with an ace band led by an innovative artist who has brought her unique vision to glorious life!